A verbal battle between two Catholic leaders over the body of legendary Archbishop Fulton Sheen has put the former television personality’s sainthood campaign on hiatus. 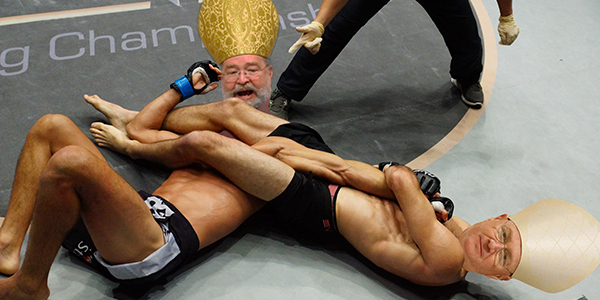 Spokesman for the New York Diocese John Frank told EOTT today that Dolan was saddened by accusations leveled on him by the Peoria bishop, and said that since Jenky was “itchin’ for a stitchen’,” that the New York Diocese would accommodate him and set up a bare knuckle, mixed martial arts throw down in the octagon. Even the Vatican office that oversees the creation of saints hasn’t been able to resolve the unusually public dispute between New York and Peoria, but have shown a lot of interest in the MMA fight between the two bishops.